Weather apps are a dime a dozen these days. iOS designers have proven that they know how to create beautiful, intuitive weather apps like Dark Sky, Solar, Today Weather, Weather Neue, Check the Weather, and so on. One of the earlier weather iPhone apps with a unique, beautiful design was Outside. 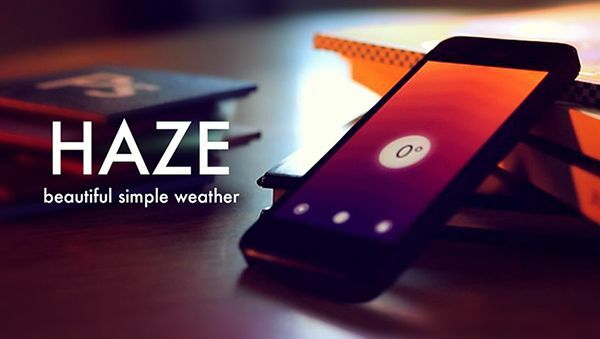 The same company behind Outside, Robocat, has released a totally new weather app in the App Store today called Haze. Haze gives you a radiantly crafted 5 day forecast at a glance. Built from the ground up with OpenGL ES and OpenAL. Swipe through and explore weather information related to sunshine, temperature and rain with a polished audiovisual experience. Is it going to be warmer tomorrow? Don’t read it. See it. The beautifully animated background shows you the trend. Use Haze frequently to unlock colorful themes and customize the look. The app took six designers six months to make, and Robocat interviewed iOS users to find out what they really want from a weather iPhone app. The project was a joint effort between Robotcat and Taptanium. Haze is relatively minimalistic in its approach, and that’s by design. There’s no radar or hourly forecasts. There is still detailed information like wind direction and humidity, but it’s hidden from the main interface to let you focus on the essentials. Gestures and some delightful sounds are used to give the app its charm. Colorful animations match the weather info you’re looking at, which is a nice touch. Overall, the app looks like a good balance between rich features and simplicity. Haze for iPhone is available now in the App Store for an introductory price of $1.